During the week of June 17-22, 2013, the historic 1946 Palmgren-O'Quinn house is being moved by barge from Harbor Island to the Historic Square on West Salisbury Street in Wrightsville Beach. 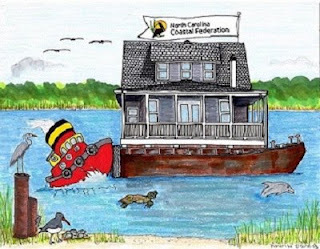 The Palmgren-O'Quinn house is home to the N.C. Coastal Federation. The organization will soon have a new Regional Office and Coastal Education Center next to the WB Museum and Chamber of Commerce. The North Carolina Coastal Federation is dedicated to providing citizens and groups with the assistance they need to take an active role in the stewardship of North Carolina’s coastal water quality and natural resources. It is a non-profit organization focused exclusively on protecting and restoring the coast of North Carolina through education, advocacy and habitat preservation and restoration. The move of this historic home will be live tweeted @NCCoastalFed on Twitter. They also have a Facebook Event dedicated to the move. This effort not only preserves a historic home but also demonstrates the North Carolina Coastal Federation's commitment to the citizens of Wrightsville Beach. This will be an exciting and fun event. You can even make plans to dine at one of our amazing waterfront restaurants to watch the house move! We're wishing the NC Coastal Federation the best of luck transporting the house safe and sound and best wishes in their new home! 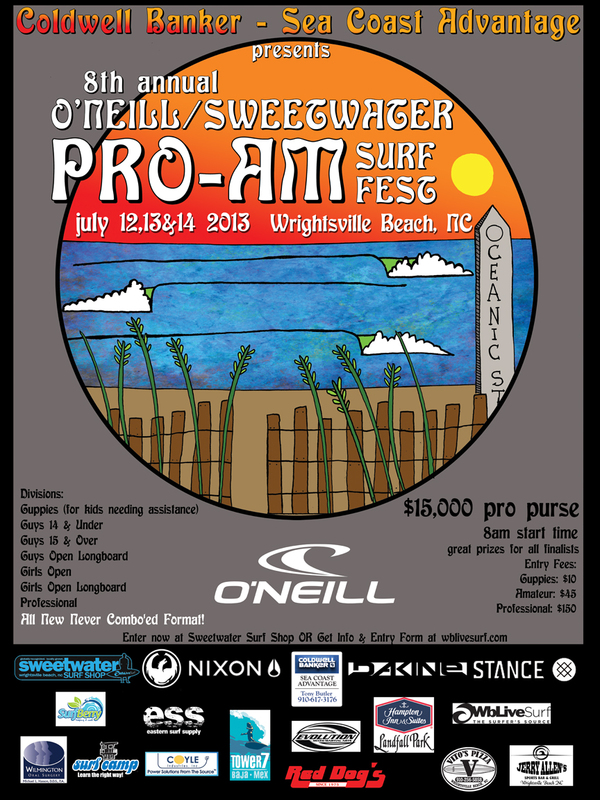 Back in Wrightsville Beach after a year off, the 8th Annual O'Neill / Sweetwater Pro-Am Surf Fest will take place on July 12, 13 & 14, 2013. 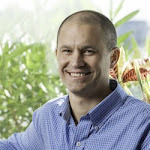 Get more info and access to the entry form at wblivesurf.com. 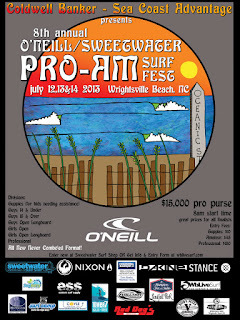 This is such a fun event for Wrightsville Beach, for the participants, and visitors. We are proud to be home to one of the world's best surfing towns and the Pro-Am Surf Fest gives us a chance to show it off! There are a number of reasons why the islands and areas around Wrightsville Beach are ideal for recreational boaters. Not only is it scenic, there are lots of fun spots to motor or paddle to. Whether your vessel is equipped with horsepower or hand-power, a day of boating along Wrightsville Beach is full of possibilities. As a boater, hopefully you have taken a Coast Guard Safety class and know the rules of the waterways and channels. Before you head off to the boat ramp or launch site, take care of the basics, such as a float plan, weather check, and life jacket count. Pack your boat before you leave with all of the essentials for your day on the water. Taking care of this the night before will ensure that nothing important is forgotten. Depending on your preferred activities, remember to pack sunscreen, snacks, water, trash bags, a bucket for your treasures, beach chairs, towels, plus fishing gear and license. In regard to your destination, are you after a natural experience at a remote location or interested in cruising around some of the island's waterfront neighborhoods? Perhaps you're headed out to the Gulf Stream for some serious fishing or have your longboard for a quick session at Masonboro Island? 1. 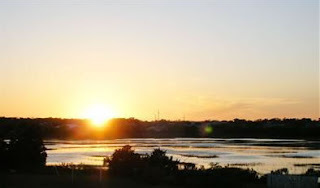 Lea-Hutaff Island - North of Wrightsville Beach, between Figure Eight and Topsail, you'll find Lea-Hutaff Island. The 5,641 acre undeveloped barrier island was once actually two separate islands. After the Old Topsail Inlet closed in 1998, they became one. The pristine strand is a favorite place for those who enjoy beach combing, bird watching, fishing, swimming, and surfing. A 35.7-acre tract of Lea-Hutaff Island was established as a partnership among Audubon North Carolina, the NC Coastal Land Trust, and the State of NC. During the spring and summer months, the island is monitored by Audubon biologists to protect large areas known to be nesting sites for both sea turtles and hundreds of beach-nesting seabirds and shorebirds, wading birds, waterfowl, and marsh birds. 2. Figure Eight Island - Just south of Lea-Hutaff, is Figure Eight Island. There is no true public access to the main part of the private island; however, the very southern tip is a favorite hangout for boaters. If you go, be respectful of the homeowners and know that anchoring here can be tricky due to the swift current of Mason's Inlet. The 5-mile stretch of beach is ideal for a leisurely stroll or just about any other seaside activity you can think of. 3. Masonboro Island - South of Wrightsville Beach is one of the most popular destinations for boaters and surfers-Masonboro Island. From the ICW side of the island, boaters often anchor out and make their way to the beach side. Another uninhabited barrier island, Masonboro is also home to a variety of wildlife and visitors are urged to tread with care. Primitive camping is allowed as long as campers set up in previously camped areas. Like Lea-Hutaff, and Figure Eight, Masonboro is just one more incredible place to spend a day at the beach! There are no lifeguards, so use precautions when swimming or surfing, such as the buddy system. There are no trash receptacles either, so PLEASE BRING YOUR OWN TRASH BAGS AND DO NOT LITTER. Be aware that along with being a potential nesting area, sand dunes and their vegetation are essential in reducing beach erosion. Never walk on the dunes or destroy coastal vegetation. After a storm, beachcombing can yield all sorts of treasures, from blue sea glass to huge conch shells and some pretty amazing driftwood. Wrightsville Beach is such a special place because of our access to unique islands, channels, and waterways. Take a tour of Wrightsville Beach by water and we're sure you'll be hooked!